AGILE (Adaptive Gateways for dIverse muLtiple Environments) builds a modular hardware and software gateway for the Internet of Things with support for protocol interoperability, device and data management, IoT apps execution, and external Cloud communication, featuring diverse pilot activities, Open Calls & Community building. 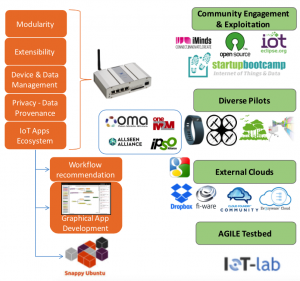 AGILE builds a modular and adaptive gateway for IoT devices. Modularity at the hardware level provides support for various wireless and wired IoT networking technologies (e.g. KNX, ZWave, ZigBee, Bluetooth Low Energy, etc.) and allows fast prototyping of IoT solutions for various domains (e.g. home automation, environment monitoring, wearables, etc.). At the software level, different components enable new features: data collection and management on the gateway, intuitive interface for device management, visual workflow editor for creating IoT apps with less coding, and an IoT marketplace for installing IoT apps locally. The AGILE software can auto-configure and adapt based on the hardware configuration so that driver installation and configuration is performed automatically. IoT apps are recommended based on hardware setup, reducing the gateway setup and development time significantly. All AGILE software modules will be delivered as 100% Open Source, with the majority of them becoming part of a new Eclipse Foundation IoT Project. The objective is to provide IoT developers and communities with software components for effective and agile IoT prototyping, and at the same time to establish a community of users and developers, maximizing the adoption of the AGILE Project. AGILE will run five pilots by QuantifiedSelf from wearables for self-tracking, and open air crop and livestock monitoring using drones, to smart retail solutions for enhanced shopping experiences. These pilots will both demonstrate the applicability of the hardware and software in managing IoT devices and creating applications and sharing data, and will set the foundations for further commercial exploitation of the Project and innovations. AGILE will become part of the existing IoT-Lab infrastructure in France managed by INRIA. With more than 2500 sensors deployed in 5 locations, AGILE users will have the opportunity to evaluate their IoT applications in real environments, collect and store sensor data, and interact with real devices. SMEs and Startups active in the IoT domain will have the opportunity to build products and services on top of AGILE hardware and software. Through two open calls that will take place during the Project lifetime, participants will be able to receive funding (up to 50k each) for building hardware and software on top of AGILE components. Partners like the Startupbootcamp IoT Program, will ensure that the call’s dissemination reaches the maximum participation of startups and innovators. AGILE creates IoT hardware and software components for multiple stakeholders. IoT entrepreneurs and SMEs who are building IoT solutions that need support of multiple protocols and networks. Download the AGILE IoT datasheet.